Accurate Lift Truck, Inc. was founded in 1982 as an independent forklift service company. For our first eight years, we grew by providing top-notch forklift service on all makes and models of lift trucks. We developed a reputation as a service driven company, the “go to” guys when you need a forklift truck fixed fast and fixed right. In 1990 became a Mitsubishi Forklift Truck Dealership. Our strategic alliance with Mitsubishi continues to grow. We offer Mitsubishi’s full line of lift trucks, pallet jacks and narrow aisle machines. Personalized service and creative partnerships with our customers are the cornerstone of our business philosophy. It is on this foundation that we build our partnerships. In January 2008 Accurate expanded into Pennsylvania, opening a facility in Quakertown, PA. Responding to customer demand for a broader range of services from a single vendor Accurate developed and grew its loading dock and commercial door division. 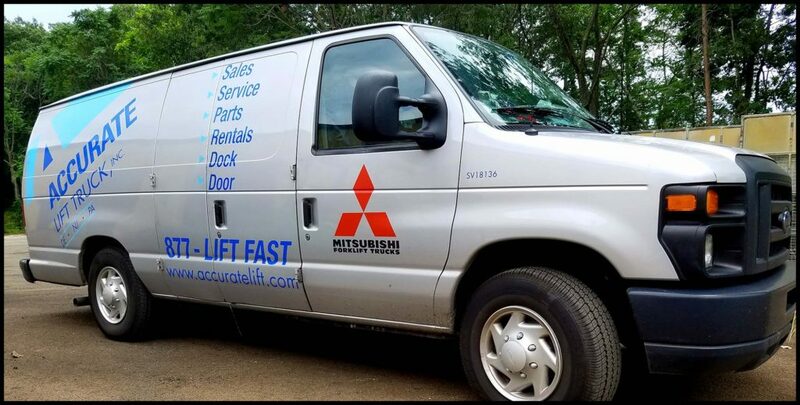 Accurate offers forklift service and forklift parts for all makes and models as well as providing access to the full line of Mitsubishi Forklift Trucks. We also offer a selection of used forklifts and warehouse equipment for sale, forklift rental from one day to five years, fleet management services, forklift battery service. Let Accurate Lift Truck by your one stop shop for all your material handling equipment needs. Give us a shot at meeting your material handling service or equipment needs. We won’t let you down.